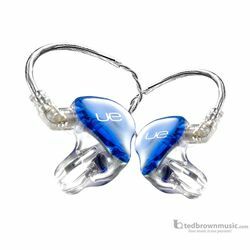 With 2 balanced armatures dedicated to the lower frequencies, the UE 11 PRO delivers tight and accurate bass. Perfect for bass players, drummers, and DJ's. In order to purchase these earphones you'll need to either come into our Tacoma location to have your ears scanned, or have ear impressions taken by an audiologist who will then send them to our Tacoma store location. Call us at 800-562-8938 to set up an appointment in store. 4 proprietary balanced armatures tuned to enhance the low frequencies. An integrated 3-way crossover turns the sub on only when it’s needed. Each order includes a personalized carrying case, and cleaning tool! Noise Isolation: -26 decibels of ambient stage noise. Internal speaker configuration:4 proprietary balanced armatures with a 3-way crossover.